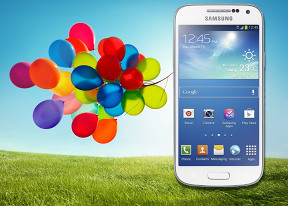 The Samsung Galaxy S4 mini uses a 4.3" Super AMOLED screen of qHD resolution (960 x 540 pixels). The pixel density clocks in at 256 ppi, which is quite good, particularly when you consider the matrix used is not of the Pentile variety. Instead it uses a layout similar to that of the Galaxy Note II with three subpixels per pixel, where the blue sub-pixel is twice as large as the red and green ones. That's a clever way to prolong the life of the screen, without sacrificing anything in terms of sharpness. Of course, you can find sharper 720p screens in these parts of the market now, but you'll need to live without the benefits of the AMOLED technology. All things considered, the Galaxy S4 mini display offers above average image quality for a midrange device. Colors a punchy, blacks are as deep as AMOLED gets them and the viewing angles are extremely wide. 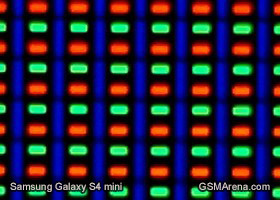 We also put the Samsung Galaxy S4 mini screen under our microscope to show you its peculiar display matrix. The Samsung Galaxy S4 mini is really easy to handle with its curved back fitting nicely in the palm of your hand. Given the friendlier, compact size, the slippery finish is a lot less an issue than it was in the bigger Galaxy S4. Single-handed operation is very comfortable and the AMOLED screen is a pleasure to look at, both indoors and outdoors.